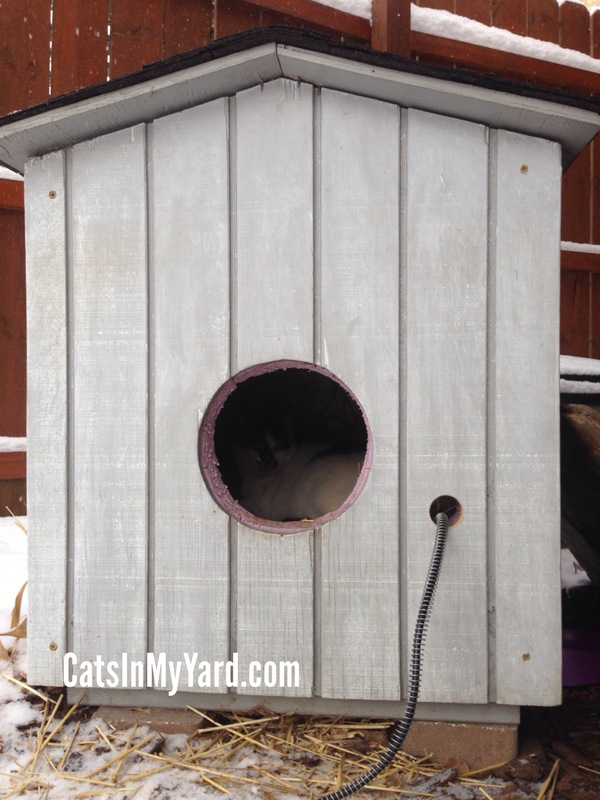 There’s a lot of quick and easy outdoor cat houses that you can make to help keep your TNR’d feline colony warm during the winter. 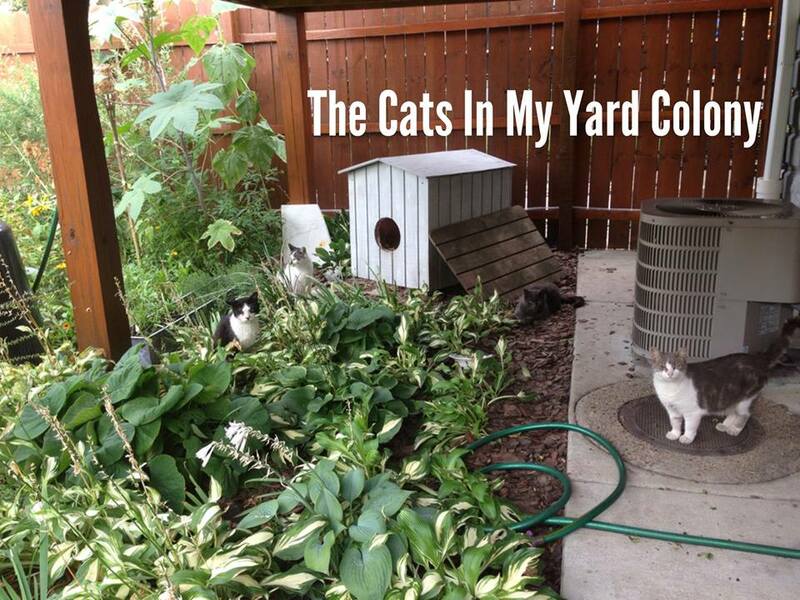 Years ago we purchased the Feral Villa and it has always been a big hit with the colony cats. 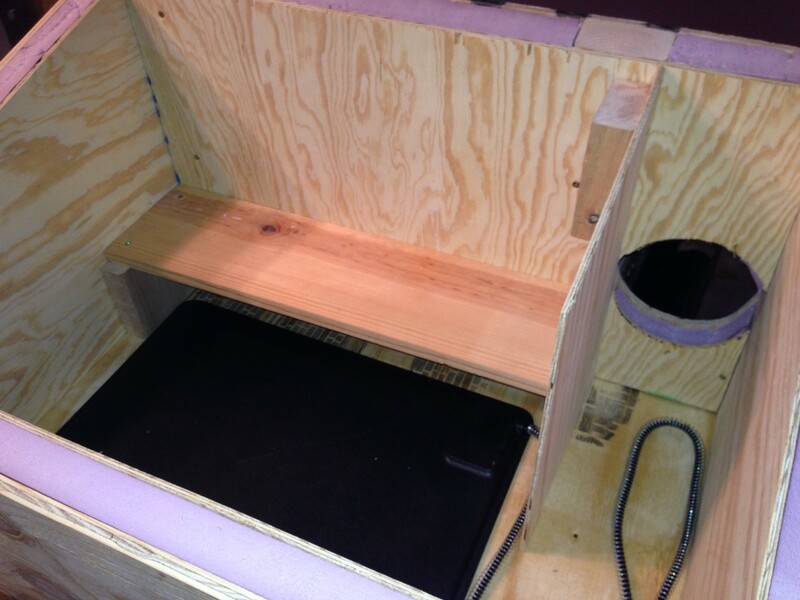 Then we made another wooden, insulated cat shelter, kind of like after the style of a dog house. 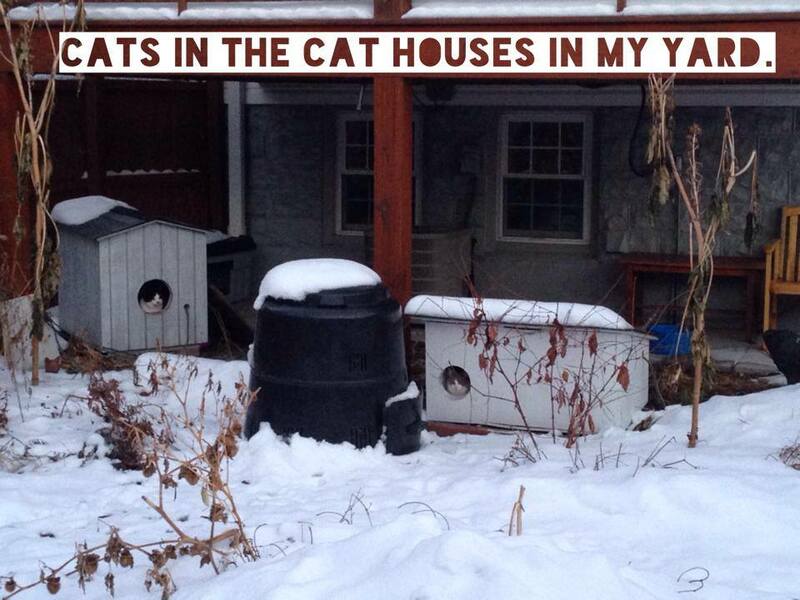 The cats use it year-round. Since Jim made it, we called it the Jim Villa. This year there was a lot of new construction in my area. A lot of abandoned homes were torn down, and a new park is being built. 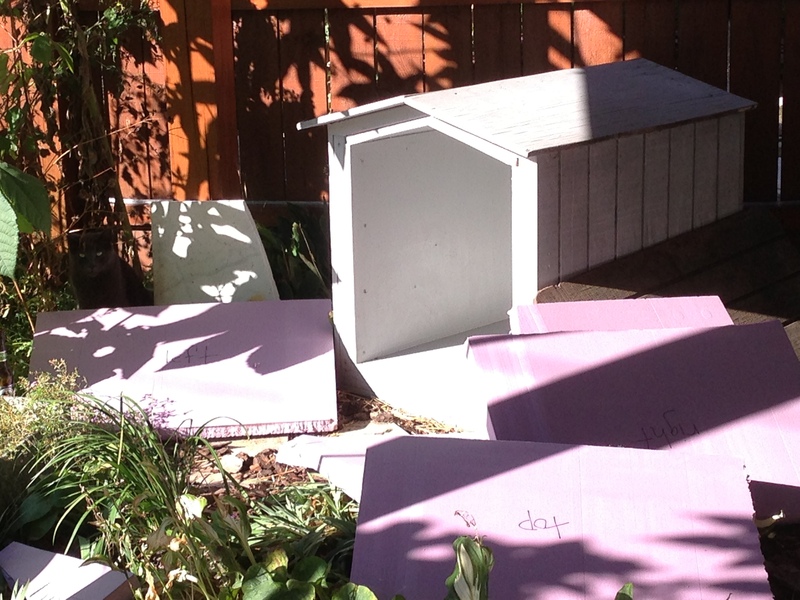 The cats used these buildings and land for shelter, and I got worried they would have nowhere to go. So we decided to add another outdoor cat house and include heat in all of them. I am so thankful for this decision, as this winter is also the year of the Polar Vortex, and I live in Chiberia. 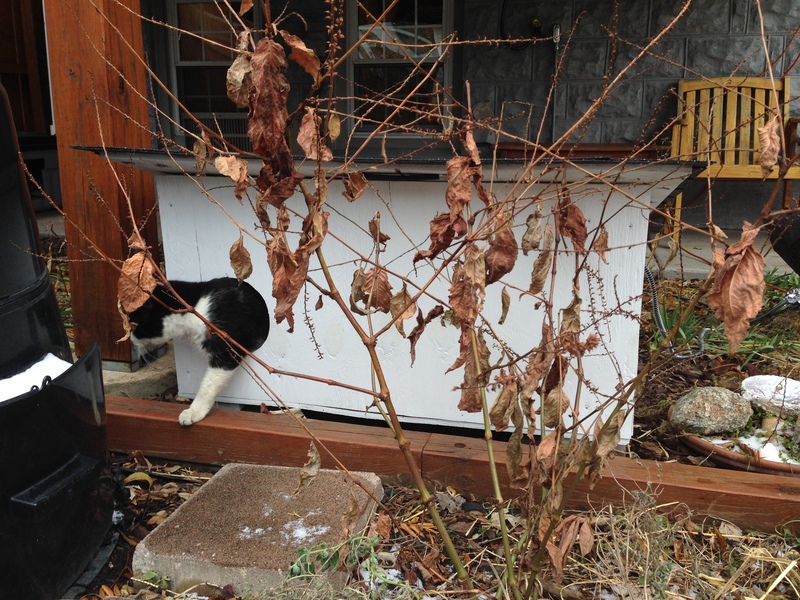 The winter has never been this cold since I started caring for and TNR’ing outdoor cats a decade ago. We’ve been having our own problems as the pipes have burst in our basement this year for the first time. 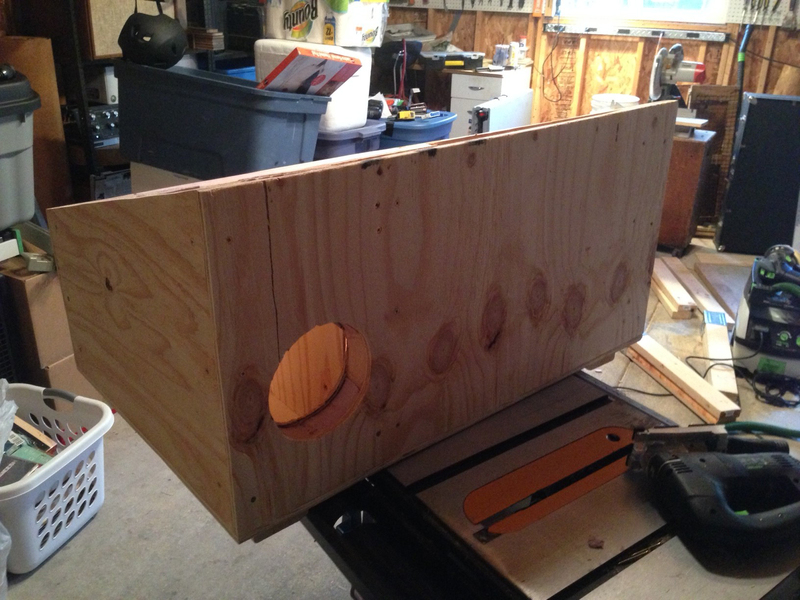 First, Jim made a new insulated cat house, using these directions from Alley Cat Allies. He modified a few of the measurements, and we call it the Alley Cat Allies Villa. Here it is in progress. We have outdoor electric outlets and decided to take a step further this year. 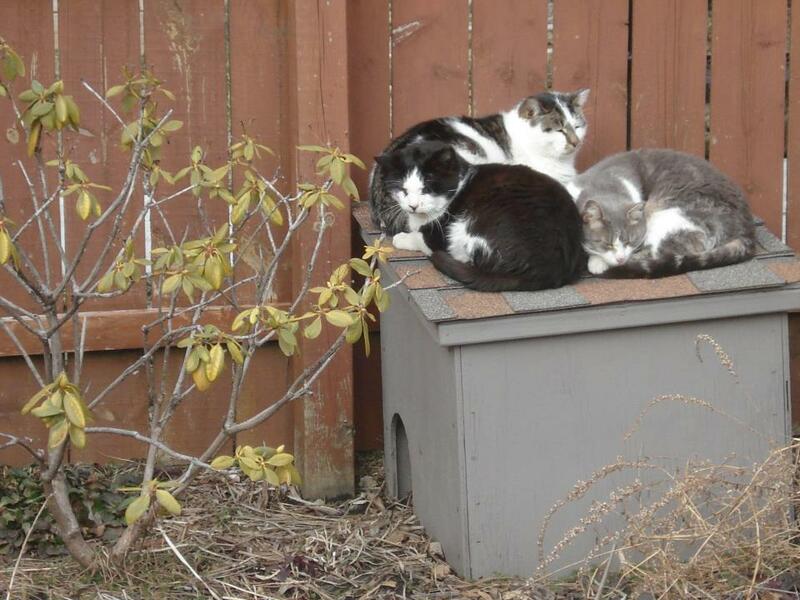 We ordered outdoor heating pads for all three of these houses from K&H Pet Products. The heating pads are activated by weight, and come in different sizes. We also purchased Thermo Cubes, which are plugs that make the heating pads turn off once the temperatures reach a certain level. I love this company. 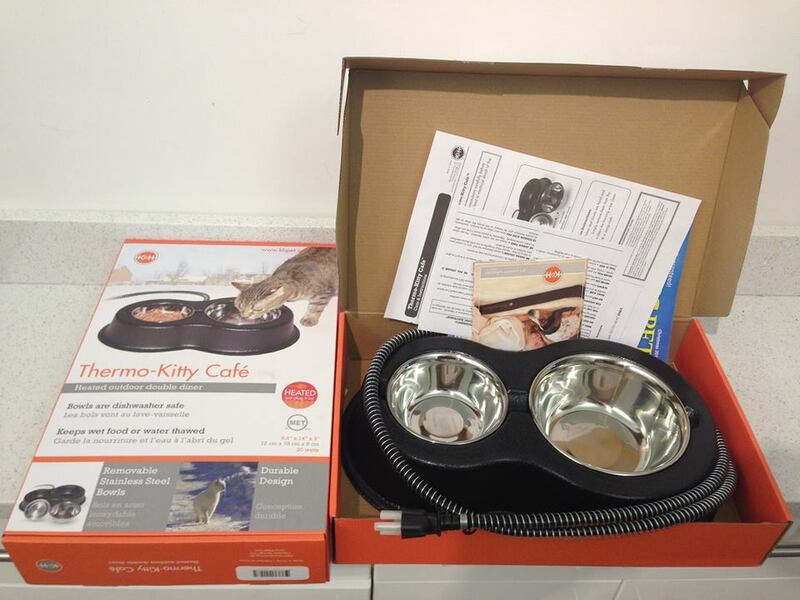 I also bought their Thermo Kitty Cafe bowls to use for wet cat food and water. They’ve been a huge hit with the feral cats. The directions say not to leave them plugged in outside, but they’ve been outside working ever since I purchased them. Bouncy Bear loves to eat and drink from all of the heated outdoor bowls. 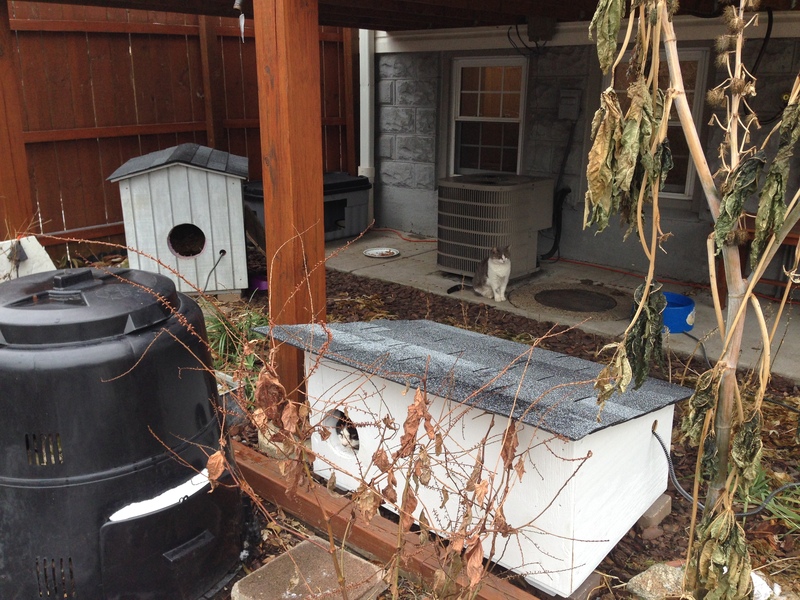 We placed the outdoor heating pads into all three of the wooden cat shelters. Here is the heating pad fitting nicely in the new Alley Cat Allies Villa. That little shelf is for them to go up on, but I’m not sure how necessary it is. It’s not a waste, by any means, because they can also fit under it. I put some straw around it to add warmth and cushion for the colony cats, but honestly, they push it to the side. They are more interested in keeping warm. We drilled a hole for the electrical cord to go out of the villa, and then plugged it into our outdoor outlets. I had to use a few extension cords because my outlets are actually up on the deck. You can see the hole drilled here. 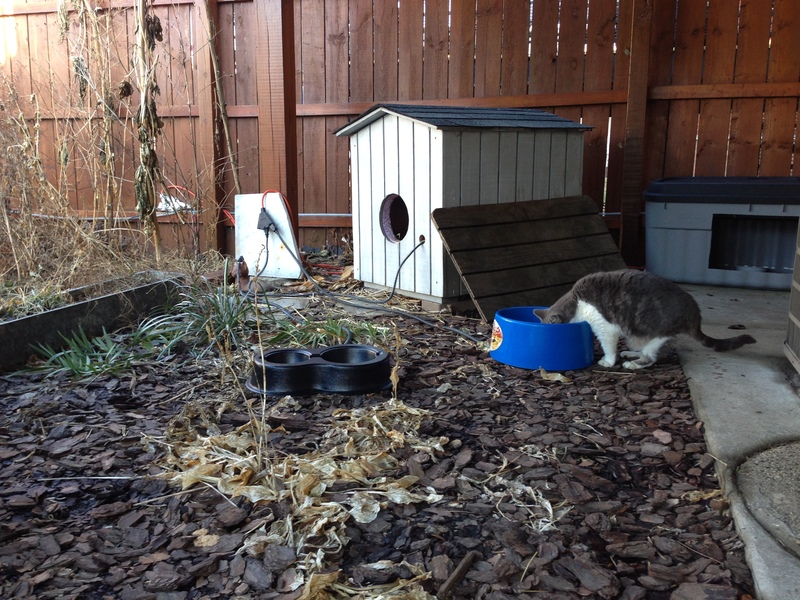 The Alley Cat Allies Villa was also taken over almost immediately by Dice, my James Gang Colony cat in my yard. When it gets really cold, he lets Bouncy Bear in there with him. The entrance hole is about six inches across, and seems to be the perfect size. Now on to the Jim Villa. Every year, it gets cleaned out, and we add new straw and insulation. The front can be easily removed with a power drill. We use the old insulation pieces as templates to cut out the new insulation pieces. 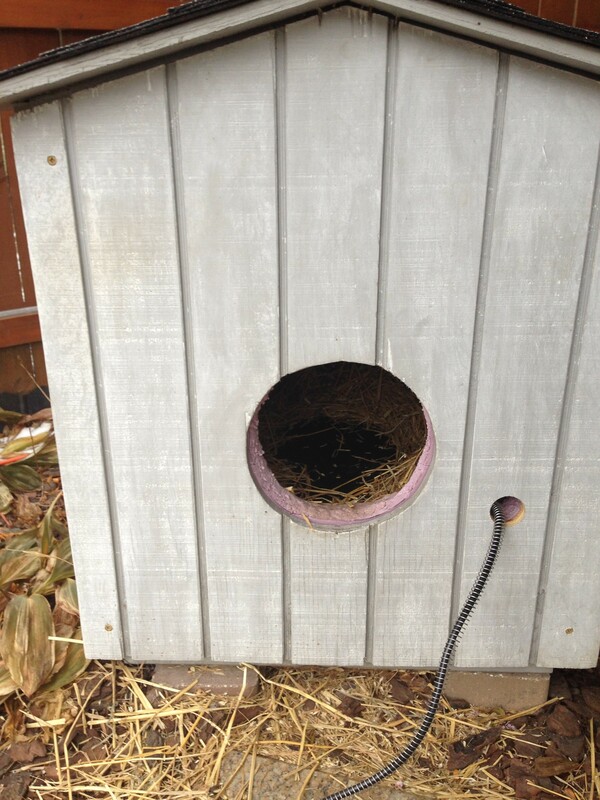 And here is the Jim Villa drilled closed, with the outdoor heated cat pad inside, added straw, and a drilled hole for the outlet. You can see the cats pushed the straw to the side again. And so does Funny Face. Now on to the Feral Villa. This was the biggest success because even the Doggy Woggy, the opossum, approves. But really, this is Dash’s house. Dash is the O.C.C. – Original Colony Cat. He was TNR’d in 2007 and he loves the Feral Villa. He just keeps his a low profile. 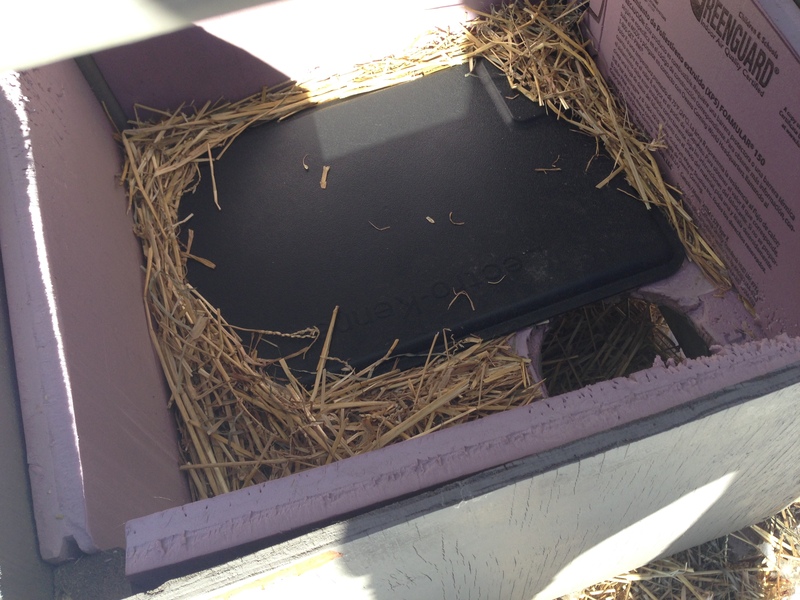 This is the inside of the Feral Villa with the heating pad and straw in it. Again, the straw is pushed to the side. I’m pretty sure Dash doesn’t share it with any other cats, and leaves if Doggy Woggy the opossum is in there, and vice versa. The cats come and go as they please, but with this extra added heat in this brutal weather, they don’t seem to be going anywhere as much. This is the scene that usually greets me when I come home. I was reading your post because I wondered if I could use the straw, which I do use now with the new K&H extreme weather heating pads I just bought. I was concerned about fires but it seems you use both straw and the pads. I have ‘doors’ also on my shelters to help keep the drafts and cold out and they are find with them. I am getting cat doors to install to give even better protection. Where did you get that large black plug connecter? I need to plug in 3 things in a 2 thing outdoor outlet. I also bought a heated water bowl since water is already freezing here. Thanks for any info. When your cats get up off of the heated pads in the winter, do they get cold because of where they were lying on the pad and got really warm? How do I know that the pad won’t to be hot for my cat to lay in? People are not susposed to lay on hearing pad long so would it be okay for my cat to lay on? Thanks for your help. Hi Tammy, I have been using those heating pads for a few years now without a problem for the same cats. They do not seem to get too warm. You can test the heat and see how they work for yourself by placing a heavy book on the heating pad – they are weight-activated. Thank you for caring for the cats! There is an attachment that you can buy for that heating pad which turns it off when it gets to a certain temp, so it regulates the temp using your cats body heat. I love your ideas! Thank you for sharing. I have 3 cats that have shown up as kittens are are probably 3 – 4 months old. I have 2 jobs, so I am gone most days, when I get home in the evenings around 10 – 11, they are waiting on me to feed them. I talk to them and feed them, but have only been able to get within a couple of feet of them. I have a friend who is going to build me houses like yours and I will add the heating pads and the heated food bowls. My question is how did you trap them for TNR? Did you have a safe trap? I worry about stressing them out. Do you have any suggestions? I don’t want to freak them out or have them get hurt, but I do want to have them fixed and healthy. Thank you!! Luann, if you call the local humane society they will place traps for your kittens and take them to the humane society to be spayed and/it neutered. They bring them right back when they’ve had time to heal. Sometimes there is a small fee but sometimes PETA will pick up tab. I guess its because I rescue homeless cats too but this this the most beautiful page of info I have seen in a long time. Their little faces looking out of the warm homes are a picture of real love, thank you for being a caring human. Thank you for your kind comment, and for all that you do for the cats, Sharon! My cat shelter inside dimensions is 30.5×17. I am wondering if the Extreme Weather Kitty Pad would be sufficient enough being it’s measurements are only 12×17 or should I go for something like the Deluxe Lectro-Kennel which offers a medium size, but it has a user controlled thermostat, so I am unsure which way to go. Could you offer advice? Thanks. Hi, it depends on how many cats are using the shelter and will be sitting on the heating pad. 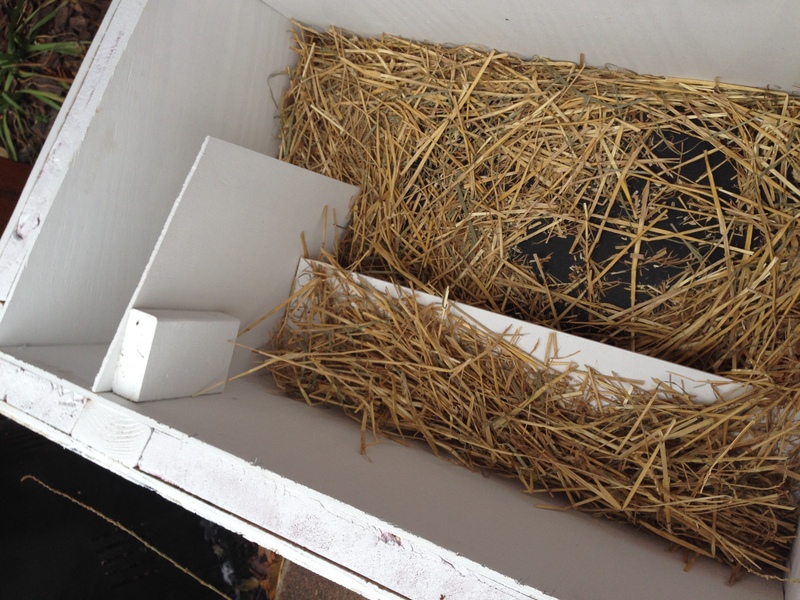 The straw and their body warmth together will also heat the shelter. I like the K&H heating pads because they’re weight-activated, but I know there are many products out there. Please feel free to let us know what you decide and how it works out. Thanks for all that you do for the cats! I ended up going with K&H medium lectro kennel pad. 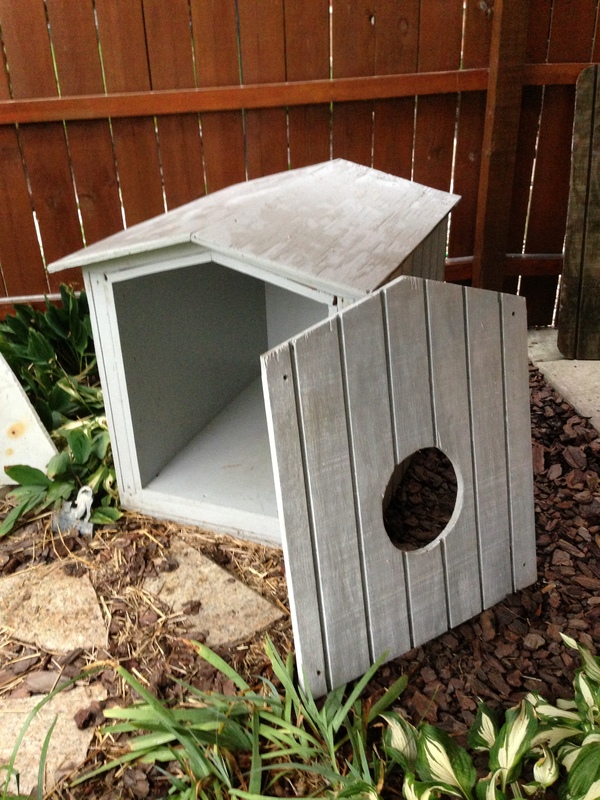 It was the perfect size and came with a soft cover for the cats to lay on inside the shelter. It is body weight activated, which is terrific for the application at hand. I live in southern part of Georgia, so it doesn’t get that cold very often, but on those night the temperature drops really low I can rest easier now knowing they have some heat. Thanks for the great ideas here on your site that inspired me! Thanks for all that you do to help the cats! I love reading about your kitties, as I am a cat lover who recently lost my 20 year old Mr. Paws. Had him since he was a baby so I have many great memories of him. I have 8 outdoor feral cats that I provide food, shelter and after 2 years they are starting to trust me more and waiting at the back door every morning for breakfast. I make the Rubbermaid Tub houses and plan to buy the K&H pads for this winter, here in Virginia it can get very frigid!! Can u suggest if I should cover the outside of the houses with anything, such as old blankets. They are under a large carport with lattice siding so the cold still blows thru there. I put the white insulation panels inside the tubs but may try the kind you used in your pictures, it does look a bit more thicker and more solid. Thanks for any and all suggestions!!! Thanks for all that you do for the cats! If you make the floor of the house larger then the heating pad, the cats will adjust their position on the pad based upon the temperature. If they’re too warm, they will put more of their body on the unheated parts of the floor. 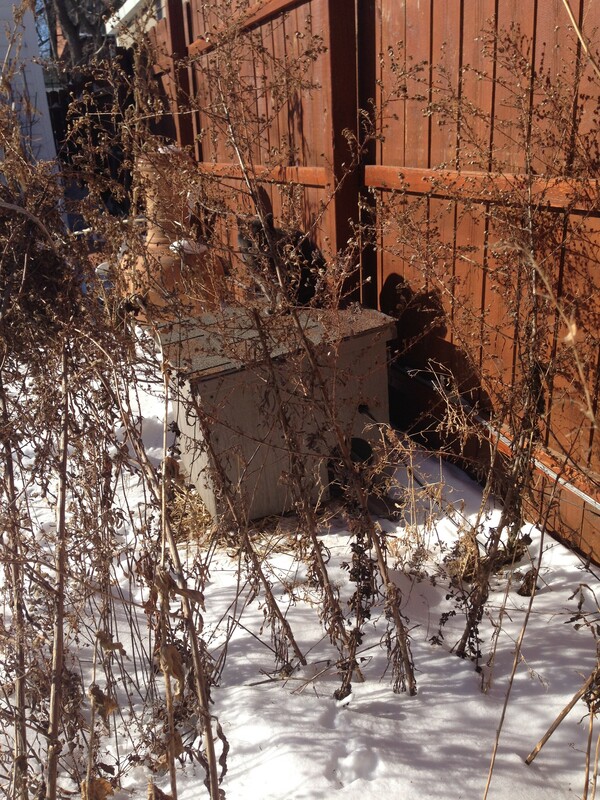 This occurs in the Fall and Spring when the weather fluctuates. In NY, the Winters are generally cold, so they spend most of the time on the heat. This is a great observation, thanks, Ronald! Appreciate all the great info! I am now the caretaker of two strays, mama and baby. Have made a temporary shelter but will build better one in summer. Worry bout the cold weather coming. We seem to do what we can. Thanks for caring for those cats, Joann! Glad I could help! Thanks for the kind words, Beth, and for all that you do for the cats! I was led to believe the heat pad I have was designed to keep my cat’s body temp. normal. It seems like the heat pad doesn’t heat the rest of the shelter. I checked the temp inside the shelter but it is the same as outside. 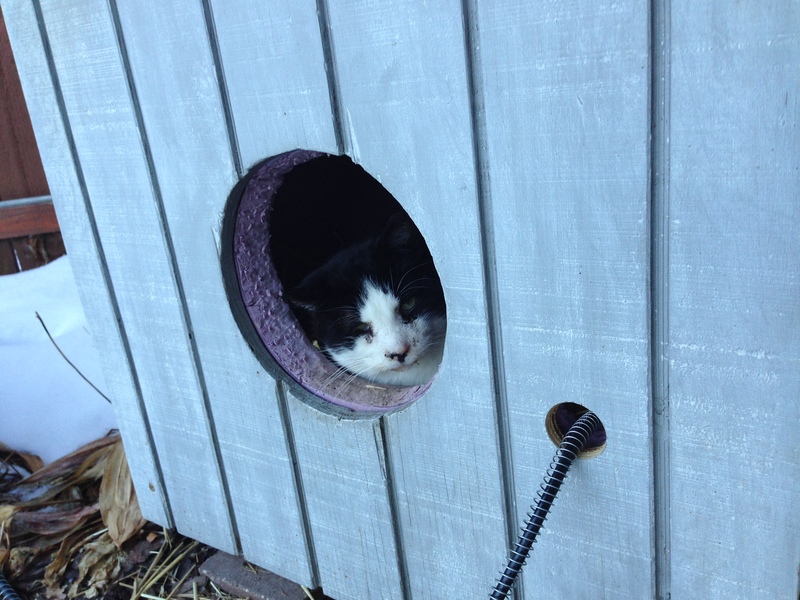 the shelter is well insulated, out of the wind and just big enough for the cat basically. Our temp. is about to drop down to -20F. I guess I’m asking should I have extra heat or just maintaining the body temp. enough. Hi Art, if you could provide extra heat somehow, I’m sure the cats would appreciate it. This is what I’ve been able to provide the cats since the Polar Vortex of 2013/2014 and it kept them warm even during those plunging temperatures. 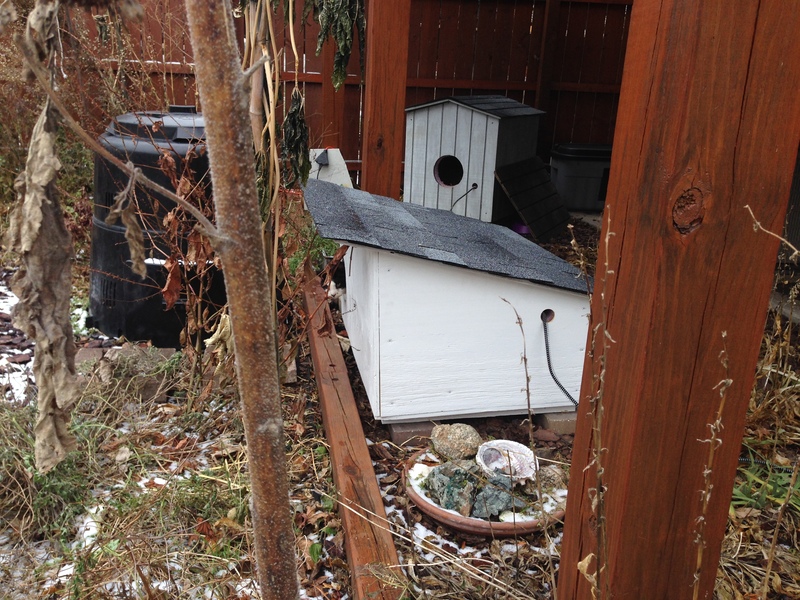 In fact, wildlife like opossums moved into the shelters as well since those cold temperatures were unprecedented. If you come up with even more solutions, I’d love to hear about them and share! Feel free to email me at [email protected] Thank you for all that you do for the cats! Hi, I’m new at the cat thing. Never had a cat, ever, just dogs. But, last Feb. I found my “Buddy” as a kitten living in a culvert while walking my dog. After 4 days of feeding him sardines ( I had no cat food), he followed me home. According to the vet he was around 6 mo. old. But, he won’t stay in the house but a few minutes. He gets weary, and frets at the door. So, I got him a cat house and put a K&H heating pad in it, and put in in my garage, and he sleeps in there at night, and stays in the cat house on the porch if it’s cold outside. But, I am worried about the temp in the garage right now, (12 degrees)! He seems OK and is snug in his house, but will this heating pad do the job? Will he be warm enough?